The original Praying Mantis system was first developed by Wang Lang(王朗) who originally lived in Shanxi province during the Ming dynasty. He started practising kungfu at an early age an was familiar with both Shaolin and Tongbeiquan. However despite his proficiency in these arts he was humiliated by an opponent at a martial arts competition. One day whilst walking home, still suffering from the shame of his defeat, he observed a praying mantis battling a bird. Despite the bird’s size, the mantis was able to deter the would-be predator through a combination of technique, speed and indomitable spirit. 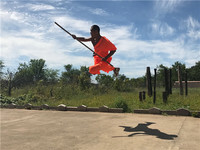 Inspired by this scene, Wang Lang began to deeply analyse the movements of the mantis and incorporate the essence of its character into a new style of kungfu. Havnig refined his new system, he returned to challenge his rival who had humiliated him before and swiftly defeated him in combat.